Now that he’s out of the military, Jamie Alderton is waging war in the physique world. Check out his training program! Military training is designed to help soldiers turn their bodies into instruments of war. Some of that training is highly secretive. When guys like Jamie Alderton reveal military training techniques (in this case, a marine endurance challenge), we soak it in like a dry towel on a weight bench. "I don't like to stick to the typical three sets, eight repetitions. I like doing high sets; I like doing low sets. I like doing pre-exhaust training and power training. Muscle confusion is the key to growth, because if your muscles are confused and being torn, the muscle fibers are going to grow and you will progress. "I usually train on a three-week rotation. I tend to do a week of pre-exhaustion training, which really puts a lot of stress on the muscle. 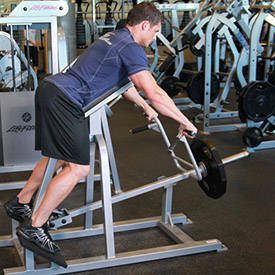 Then I will do a lot of power and strength training, based on low reps and multiple sets. I will also do an endurance week, which isn't necessarily low weight. It's moderate to heavy weight; you're just enduring and hitting 12-15 reps in the range." "I train biceps first because I think it's going to be a lot more painful to do the rest of your exercises when your biceps are on fire. You generally hear that should hit your big muscle groups first, because you want them to fail first. I want my small muscles to fail first, because it's more beneficial to what I'm doing." "I often use this workout when I am carb-depleting to deplete all my glycogen stores. It's similar to how I trained in the Army. It keeps all your muscle groups under tension for long periods of time."